Greetings! 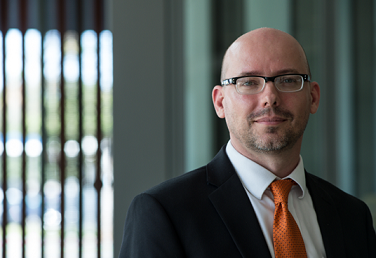 My research interests include the economics of security and privacy, cybercrime, national security, applied microeconomics, and law & economics. I am a policy researcher at the RAND Corporation. I obtained my PhD from the Heinz College of Information Systems and Public Policy at Carnegie Mellon University, advised by Alessandro Acquisti. I can be reached at sasha.romanosky [at] gmail.com. My research is motivated by the surge in social media, cloud computing, and mobile services that is fuelling the unprecedented collection, use and sale of personal consumer information. These opportunities for use of big data afford many benefits to firms, consumers, and government agencies. However individuals can be harmed when their personal information is lost, stolen, or improperly accessed. In addition to commercial purposes, individual data are used for many kinds of public sector applications such as law enforcement and national security. These surveillance data, whether collected from drones, CCTVs, license plate readers, or other sources, represent an unprecedented opportunity to detect -- and prevent -- malicious activity. The critical tension, therefore, is in balancing corporate interests, individual privacy rights, law enforcement, and national security. While there are legitimate reasons for limiting the collection, use, or sharing of personal information, excessive restrictions can be inefficient. For example, limiting the types of data that firms can collect may enhance consumer privacy, but may reduce a firm's ability to innovate. Restricted access to medical information may reduce medical fraud, but it may also inhibit important medical research or identify disease outbreaks. Limiting access to location or cloud-based data may hinder the government's ability to investigate serious crimes. How is consumer data regulated today? The management of personal consumer information is regulated by many disparate state and federal laws. On one hand, states may prohibit the selling, sharing or public disclosure of personal information. For example, some states specifically prevent the sale of driver tollbooth information, while other states prevent the collection or public notice of social security, zip code, and social media account information. On the other hand, state laws allow, or require, the disclosure of personal information. For example, most states require that companies notify individuals when their personal information has been lost or stolen, while others require consumer notice if a company collects your information with intent to sell it. But what is the full landscape of state and federal information laws? How can firms continue to innovate despite increasing data restrictions? Do these laws work as intended, or do they introduce perverse outcomes? What consequences and benefits exist for protecting critical infrastructure, and how can these effects be empirically measured? How do Information Policies work, and how do they reduce externalities? Legislators often consider a number of alternative policy interventions to help reduce externalities caused by the unauthorized disclosure or collection of information, such as ex ante safety regulation (mandated standards), information disclosure, and ex post liability. Ex ante regulation is often a heavy-handed prevention mechanism that enforces a minimum standard of care. However, its effectiveness is hampered when the regulated inputs are only loosely correlated with the harmful outputs. Disclosure, on the other hand, can be a corrective mechanism that empowers individuals to avoid potential harms. However, cognitive biases may instead burden individuals, preventing them from acting. Finally, ex post liability allows victims to recover any losses through civil litigation, thereby forcing firms to internalize any harm. But are these interventions effective? How do they drive firm and consumer behaviors, and how do they affect overall social costs? These issues present many wonderful opportunities for rigorous empirical and inter-disciplinary research in security and privacy, information policy, applied microeconomics, and law & economics. [J8]	Romanosky, S., Goldman, Z. (2017). Understanding Cyber Collateral Damage, Journal of National Security Law and Policy, 9(1). [J7]	Romanosky, S. (2016). Cost and Consequences of Cyber Incidents, Journal of Cybersecurity, 2(2), 121-135. [J6]	Romanosky, S., Goldman, Z. (2016). Collateral Damage, Procedia Computer Science, 95, 10-17, Available at http://dx.doi.org/10.1016/j.procs.2016.09.287. [J5]	Ablon, L., Heaton, P., Lavery, D., Romanosky, S., Consumer Attitudes Toward Data Breach Notifications and Loss of Personal Information, RAND Corporation, RR-1187-ICJ, 2016. [J3]	Romanosky, S., Hoffman, D., and Acquisti, A. (2014). Empirical Analysis of Data Breach Litigation. Journal of Empirical Legal Studies, 11(1), 74–104. [J2]	Romanosky, S., Telang, R. & Acquisti, A. (2011). Do Data Breach Disclosure Laws Reduce Identity Theft? Journal of Policy Analysis and Management, 30(2), 256-286. [J1]	Romanosky, S. & Acquisti, A. (2009). Privacy Costs and Personal Data Protection: The Economic and Legal Perspectives. Berkeley Technology Law Journal, 24(3). [WP3]	Content Analysis of Cyber Insurance Policies: How Do Insurance Companies Price Cyber Risk?,with Lilian Ablon, Therese Jones, Andreas Kuhn (in review). [WP2]	Health Provider incentives and the value of EMR: Evidence of EMR increasing outpatient charges, with Idris Adjerid and Ellerie Weber. [WP1]	Is an ounce of prevention worth a pound of cure? : Balancing ex ante security with ex post mitigation, with Veronica Marotta, Richard Sharp, and Alessandro Acquisti (in review). [B3]	Herr, T., Harrison, R., eds. (2016). Cyber Insecurity: Navigating the Perils of the Next Information Age. Rowman & Littlefield. [B2] Schumacher, M., Fernandez-Buglioni, E., Hybertson, D., Buschmann, F., Sommerlad, P. (eds). (2006). Security Patterns: Integrating Security and Systems Engineering. Wiley & Sons, p 101-141, 164-176. [B1] Juric, M., Nashi, N., Berry, C., Kunnumpurath, M., Carnell, J., & Romanosky, S. (2002). J2EE Design Patterns Applied. WROX Press. [IP17] Private-Sector Attribution of Cyber Attacks: A Growing Concern for the U.S. Government?, Lawfare, December 21, 2017, Available at https://lawfareblog.com/private-sector-attribution-cyber-attacks-growing-concern-us-government. [IP16]	It’s Time for the International Community to Get Serious about Vulnerability Equities, with Kate Charlet, and Bert Thompson. Lawfare, November 15, 2017, Available at: https://www.lawfareblog.com/its-time-international-community-get-serious-about-vulnerability-equities. [IP15]	The Equifax Breach: Yawn, or Yikes? Inside Sources, November 3, 2017, Available at: http://www.insidesources.com/equifax-breach-yawn-yikes/. [IP14]	What Is Cyber Collateral Damage? And Why Does It Matter?, with Zachary K. Goldman, Lawfare, November 15, 2016. Available at https://www.lawfareblog.com/what-cyber-collateral-damage-and-why-does-it-matter. [IP13] The Future of Cyber Investigations at the FBI is Unclear, with Cortney Weinbaum, Inside Sources, August 24, 2016. Available at http://www.insidesources.com/the-future-of-cyber-investigations-at-the-fbi-is-unclear/. [IP12] The High Cost Of Hacks: Is Cyber Insurance To Blame For The Increasing Cost Of Data Breaches? US NEWS, March 6, 2015. Available at http://www.usnews.com/opinion/blogs/world-report/2015/03/06/cyber-insurers-must-do-a-better-job-of-assessing-risk-of-hacks. [IP11]	Herr, T., Romanosky, S. (2015). Cyber Crime: Creating Roadmap to Effective Cyber Legislation, The American Foreign Policy Council Defense Technology Program Brief, (11). [IP10] Privacy Research Group Blog, Information Law Institute, NYU, School of Law, http://blogs.law.nyu.edu/privacyresearchgroup/, 2012-2013. [IP9] Comments to the Department of Commerce on Incentives to Adopt Improved Cybersecurity Practices (through cyber-insurance), http://www.ntia.doc.gov/files/ntia/romanosky_comments.pdf, 2012. [IP8] Concurring Opinions, (blog), www.concurringopinions.com, (Invited Contributor), 2010-2011. [IP7]	Mell, P., Scarfone, K., & Romanosky, S. (2007). NIST Interagency Report (NIST IR) 7435, The Common Vulnerability Scoring System (CVSS) and Its Applicability to Federal Agency Systems. National Institute of Standards and Technology (NIST). [IP6]	Mell, P., Scarfone, K., & Romanosky, S. (2007). A Complete Guide to the Common Vulnerability Scoring System Version 2.0. Forum of Incident Response and Security Teams (FIRST). [IP5]	Mell, P., Scarfone, K., & Romanosky, S., (Nov/Dec, 2006). Common Vulnerability Scoring System. IEEE Security and Privacy, 4(6) 85-89. [IP4]	Romanosky, S., Kim, G., & Kravchenko, B. (Oct 2006). Global Technology Audit Guide 6 (GTAG):Managing and Auditing IT Vulnerabilities. The Institute of Internal Auditors. [IP3]	Cranor, L. F., Egelman, S., Hong, J., Kumaraguru, P., Kuo, C., Romanosky, S., Tsai, J., & Vaniea, K. (2005). FoxTor, A Tor Design Proposal. Carnegie Mellon University’s Usable Privacy and Security (CUPS) Laboratory. [IP2]	Schiffman, M., Eschelbeck, G., Ahmad, D., Wright, A. & Romanosky, S. (2004). CVSS: A Common Vulnerability Scoring System. Forum of Incident Response and Security Teams (FIRST). [IP1]	Romanosky, S. (March 2003). Enterprise Security Patterns. Information Systems Security Association Journal. [CP12]	Content Analysis of Cyber Insurance Policies: How Do Insurance Companies Price Cyber Risk?, Workshop on the Economics of Information Security (WEIS), San Diego, CA, June 26-27, 2017. [CP11]	(Presentation by Josh Baron) Collateral Damage, Complex Adaptive Systems 2016, Los Angeles, CA, November 2-4, 2016. [CP10]	Provider incentives and the value of EMR: Evidence of hospitals using EMR to increase outpatient charges, 5th Annual Workshop on Health IT and Economics (WHITE), Washington DC, October 10-11, 2016. [CP9]	Romanosky, S., Hoffman, D. & Acquisti, A. Empirical Analysis of Data Breach Litigation, iConference, College of Information, University of North Texas, February 12-15, 2013. [CP8]	(Presentation by Alessandro Acquisti) Romanosky, S., Hoffman, D. & Acquisti, A. Empirical Analysis of Data Breach Litigation, 11th Workshop on the Economics of Information Security (WEIS), Berlin Brandenburg Academy of Sciences, Berlin, Germany, June 25-26, 2012. [CP7]	Romanosky, S., Hoffman, D. & Acquisti, A. Empirical Analysis of Data Breach Litigation, International Conference on Information Systems (ICIS), Shanghai, China, December 4-7, 2011. [CP6]	Romanosky, S., Hoffman, D. & Acquisti, A. Empirical Analysis of Data Breach Litigation, Fifth Annual IFIP WG 11.10 International Conference on Critical Infrastructure Protection (IFIP), Dartmouth College Hanover, NH, March 23–25, 2011. [CP5]	Romanosky, S., Sharp, A. & Acquisti, A. Data Breaches and Identity Theft: When is Disclosure Optimal?, 9th Workshop on the Economics of Information Security (WEIS), Harvard University, Cambridge, MA, June 8, 2010. [CP4]	Romanosky, S., Telang, R. & Acquisti, A. Do Data Breach Disclosure Laws Reduce Identity Theft?, Conference on Empirical Legal Studies (CELS), Yale University, New Haven, CT, November 5-6, 2010. [CP3]	Romanosky, S., Telang, R. & Acquisti, A. Do Data Breach Disclosure Laws Reduce Identity Theft?, 7th Workshop on the Economics of Information Security (WEIS), Dartmouth College, Hanover, NH, June 25-28, 2008. [CP2]	Kuo, C., Romanosky, S. & Cranor, L. F. (2006). Human Selection of Mnemonic Phrase-based Passwords. Proceedings of the 2006 Symposium on Usable Privacy and Security (SOUPS), Carnegie Mellon University, Pittsburgh, PA, July 12-14, 2006. [CP1]	Romanosky, S., Acquisti, A., Cranor, L. F., Hong, J. & Friedman, B. (2006). Privacy Patterns for online interactions. Proceedings of the 2006 Conference on Pattern Languages of Program, Portland, OR, October 21-23, 2006. [P76]	Content Analysis of Cyber Insurance, TPRC, George Mason University, Arlington, VA, Sept 8, 2017. [P75]	Cyber Collateral Damage, NSA Information Assurance Symposium, Baltimore, MD, June 21, 2017. [P74]	Managing DoD's Vulnerability Disclosure Program, NSA Information Assurance Symposium, Baltimore, MD, June 21, 2017. [P73]	Private Sector Attribution of Cyber Incidents, NSA Information Assurance Symposium, Baltimore, MD, June 21, 2017. [P70]	Research Opportunities in Think Tanks, PUBP 850 Professional Development Seminar, Schar School of Policy and Government, George Mason University, April 6, 2017. [P69]	Content Analysis of Cyber Insurance Policies: How do Carriers Price Cyber Risk?, 2nd Annual Digital Information Policy Scholars Conference, George Mason University, Arlington, VA, April, 28, 2017. [P64]	Legal and Policy Dimensions of Cybersecurity, George Washington University, Washington, DC, September 27-29, 2016. [P62]	Fourth Annual LEC Public Policy Conference on the Law & Economics of Privacy and Data Security, George Mason University, Arlington, VA, June 22-23, 2016. [P58]	Costs and Consequences of Cyber Incidents, Digital Information Policy Scholars Conference, George Mason University, Arlington, VA, April 29, 2016. [P51]	Costs and Consequences of Cyber Incidents, PrivacyCon, Federal Trade Commission, Washington DC, January 14, 2016. [P46]	Costs and Consequences of Cyber Incidents, Law & Economics Privacy Fellows Research Roundtable, George Mason University, Arlington, VA, December, 10-11, 2015. [P41]	Cyber Crime: Creating Roadmap to Effective Cyber Legislation, New America Foundation, Washington, DC, May 14, 2015. [P34] Public Disclosure of Data Breaches: Optimizing Ex Ante And Ex Post Security Investments, Law and Economics of Data Security Policy, George Mason University, Arlington, VA, March 7, 2014. [P28]	The Dr. Jekyll and Dr. Hyde of Health IT:Does Health IT Increase Medical Billing Fraud?, INFORMS Healthcare Conference, Chicago, IL, June 23-26, 2013. [P22]	Empirical Analysis of Data Breach Litigation, Canadian Law and Economics Association, University of Toronto, Canada, September 28-29, 2012. [P19]	Empirical Analysis of Data Breach Litigation, 39th Research Conference on Communication, Information and Internet Policy (Telecommunications Policy Research Conference), George Mason University Law School, Arlington, VA, September 23-25, 2011. [P18]	Empirical Analysis of Data Breach Litigation, Fourth Annual Privacy Law Scholars Conference (PLSC), Berkeley, CA, June 2-3, 2011. [P17]	Data Breaches and Identity Theft: When is Disclosure Optimal?, iConference, Seattle, WA, February 8-11, 2011. [P16]	Empirical Analysis of Data Breach Litigation, Seventh Annual Forum on Financial Information Systems and Cybersecurity: A Public Policy Perspective, University of Maryland, College Park, MD, January 19, 2011. [P15]	Data Breaches and Identity Theft: When is Disclosure Optimal?, Telecommunications Policy Research Conference (TPRC), George Mason University School of Law, Arlington, VA, September 23-25, 2010. [P13]	Data Breaches and Identity Theft: When is Disclosure Optimal?, Sixth Annual Forum on Financial Information Systems and Cybersecurity: A Public Policy Perspective, University of Maryland, College Park, MD, October 28, 2009. [P12]	Data Breaches and Identity Theft: When is Disclosure Optimal?, Institute for Operations Research and the Management Sciences (INFORMS), San Diego, CA, October 12, 2009. [P8]	The Common Vulnerability Scoring System (CVSS), CyLab, Carnegie Mellon University, November, 2008. [P7]	The Common Vulnerability Scoring System (CVSS), Institute of Infrastructure Protection (I3P), Cornell University, October, 2008. [P6]	Do Data Breach Disclosure Laws Reduce Identity Theft?, Fifth Annual Forum on Financial Information Systems and Cybersecurity: A Public Policy Perspective, University of Maryland, College Park, MD, May, 2008. [P4]	Do Data Breach Disclosure Laws Reduce Identity Theft?, Workshop on Information Systems Economics (WISE), McGill University, Montreal, Canada, December, 2007. [P3]	Managing and Auditing IT Vulnerabilities. The Institute of Internal Auditors Information Technology Conference, Scottsdale, AZ, April 2007. I am one of the original authors of CVSS, and have been working on it since 2003. Please see FIRST.ORG for a full description of the current standard. Standardized Vulnerability Scores: When an organization normalizes vulnerability scores across all their software and hardware platforms, they can leverage a single vulnerability policy to address each of them. This policy may be similar to a service level agreement (SLA) that states how quickly a particular vulnerability must be validated and remediated. Prioritized Risk: When the final score is computed, the vulnerability now becomes contextual. That is, vulnerability scores are now representative of the actual risk to an organization. They know how important, in relation to other vulnerabilities, is a given vulnerability. Open framework: Users can be confused when a vulnerability is given a certain score. What properties gave it that score? How does it differ from this other one, or why is it not the same? With CVSS, anyone can view the exact metric values that were used to formulate the overall score. CVSS is part of the Payment Card Industry Data Security Standard (PCI-DSS), NIST's SCAP Project, and has been formally adopted as an international standard for scoring vulnerabilities (ITU-T X.1521). IT organizations consume great resources in identifying and remediating computer vulnerabilities. Compound this with the reality that the group finding the vulnerabilities is generally not the group fixing them. This results in a resource-intensive and sometimes adversarial organizational dynamic. Managing and Auditing IT Vulnerabilities is the 6th in a series of Global Technology Audit Guides (GTAGs) published by the Institute of Internal Auditors (the IIA). We discuss the steps of first identifying, assessing then prioritizing computer vulnerabilities. We differentiate many of the characteristics of low- with high-performing vulnerability management organizations and we include a number of metrics than an organization can use to establish a datum and track their progress. We recognize that immediate benefits are achieved by remediating individual, yet critical vulnerabilities. 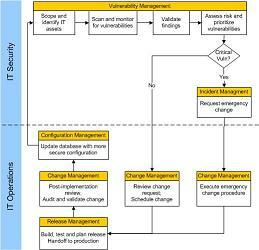 However, as shown in the diagram, effective vulnerability management means integrating and aligning IT Security with the organization's existing IT management processes (e.g. within an ITIL framework). Visit Markus Schumacher's site or hillside.net for more information on security patterns. Sasha Romanosky, CISSP, researches topics on the economics of security and privacy, national security, applied microeconomics, and law & economics. He is a Policy Researcher at the RAND Corporation, a faculty member of the Pardee RAND Graduate School, and an affiliated faculty in the Program on Economics & Privacy at the Antonin Scalia Law School, George Mason University. He has published in the Journal of Policy Analysis and Management, the Journal of Empirical Legal Studies, the Journal of Cybersecurity, the Journal of National Security Law and Policy, and the Berkeley Technology Law Journal. Sasha holds a Ph.D. in Public Policy and Management from Carnegie Mellon University and a B.S. in Electrical Engineering from the University of Calgary, Canada. He was a Microsoft research fellow in the Information Law Institute at New York University School of Law, and a security professional for over 10 years in the financial and e-commerce industries. Sasha is also co-author of the Common Vulnerability Scoring System (CVSS), an international standard for scoring computer vulnerabilities. Sasha is a former Cyber Policy Advisor in the Office of the Secretary of Defense for Policy (OSDP) at the Pentagon. He oversaw the Defense Department's Vulnerability Equities Process (VEP), the Vulnerability Disclosure Program (VDP), and other cyber policy matters, for which he received the Defense Medal for Exceptional Public Service.